Chateau Hansen’s vineyards near the Gobi desert. Chinese winery Chateau Hansen, based on the edge of the Gobi Desert, is set to sell a new icon wine for €500 a bottle in its home market. Hansen, based in Wuhai, Inner Mongolia, is poised to release the new wine, a single varietal Cabernet Sauvignon called Red Camel, this summer. 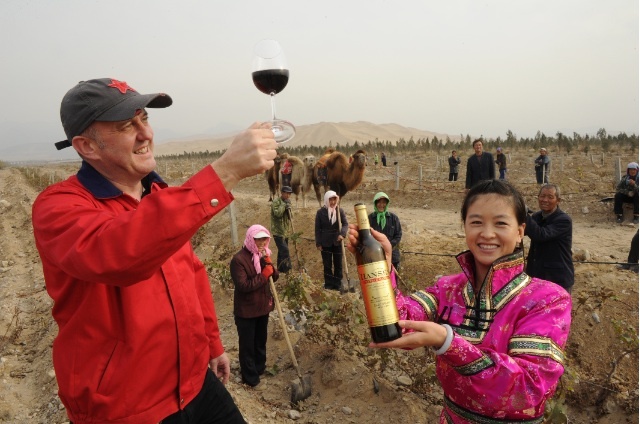 Up to 10,000 bottles of Red Camel will be produced, sourced from a single parcel of vines in organic vineyards in the neighbouring region of Ningxia. The grapes are harvested in two waves: the first batch, making up about two-thirds of the blend, when the grapes reach about 12% alcohol; and the second very late, when the vines are bare and the grapes are beginning to shrivel. Christie’s is capitalising on the thirst for wealthy Chinese consumers to buy wineries by opening the world’s first estate agency for would-be vineyard buyers. Vineyards by Christie’s International Real Estate, billed as the “first global advisory for buyers of vineyard estates”, is to open in Hong Kong. Run by both wine experts and luxury property specialists, the agency will offer a consultancy service for clients looking to acquire vineyards around the world. According to David Elswood, Christie’s international director of wine in Europe and Asia, the idea for the agency came after continued demand from clients at the auction house’s wine auctions in Hong Kong for advice on buying vineyard properties overseas. “We are uniquely positioned to offer this highly specialised vineyard advisory acquisition service and we look forward to this exciting venture,” he said. In addition to advice on which wineries are on sale around the world, Christie’s will also provide clients with custom travel arrangements and translation services. “Wineries in sought after locations are often small and discrete, and without guidance, buyers never even know they are on the market. Chinese wine industry could endanger Panda’s habitat. The habitats of endangered giant pandas are being threatened by planned vineyard plantings in the Chinese provinces of Shaanxi and Sichuan. According to the South China Morning Post, authorities in Shaanxi plan to plant 18,000 hectares of vineyards, and similar schemes are in the pipeline for Sichuan, putting the 1,600 wild giant pandas that inhabit the provinces at risk. While the Chinese government has set up reserves for giant pandas, the animals don’t always remain inside them. 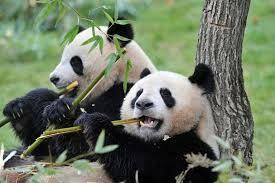 “Vineyards around a panda reserve can definitely affect the animals. “Pandas move outside of reserves, so the forest outside is an important habitat. If forest is cleared to plant grapes, there may be direct loss of panda habitat,” climate change specialist Dr. Lee Hannah said in a study of the impacts of climate change on wine production and conservation. What do Chinese wine consumers really think? Distilling 4 years of experience working in China into a 40 minute lecture was never going to be easy. Yet this was the challenge set us by the UK Market Research Society (MRS) a couple of weeks ago, when they invited us to address our fellow market research professionals in a session entitled “In Vino Veritas? The challenges of finding out what the Chinese really think about wine”. The extent to which Chinese people are different from each other is tough to grasp from an occidental perspective – at least at first. The complexity of the country in terms of its cuisines, languages, climates, economic layers, culture, and lifestyle becomes apparent with time spent in the country, and away from the Tier 1 cities. Hangzhou is not like Harbin, which is very different from Chengdu. So which is the real China? It’s a bit like flying from Bremen to Barcelona, and having to decide, between those two cities, which represents the real Europe – a decision both impossible and pointless. Asian drinkers keep Bordeaux out of the red. Bordeaux wine sales continue to rise, stimulated by a thirsty export market that is in contrast to falling French consumption of the region’s wines. Bordeaux recorded a 2 percent increase in volume sales and a 10 percent growth in value in the year ending July 2012, according to figures released by the regional trade association, the CIVB, on Monday. The region has defied the economic downturn, shipping 5.5m hectoliters of wine worth 4.3 billion euros ($5.6bn) in the last year. While “the current and future economic situation remains difficult, the figures for 2012 can be considered satisfactory,” said Georges Haushalter, president of the CIVB. Results from the latest auction suggest Asian collectors could soon be heading south of Burgundy. Cheers to Burgundy, hello to the Rhone. There are signs that the fine wines of the Rhône Valley are beginning to garner interest from Asian buyers, following the buoyant sale results of Paul Jaboulet Aîné’s wines at Sotheby’s over the weekend. The December 8 auction in Hong Kong suggests fine-wine collectors in Asia are prepared to look beyond Bordeaux and Burgundy. All of the lots, which came direct from the producer’s cellar, were sold, with the 1961 Hermitage La Chapelle fetching 171,500 Hong Kong dollars ($21,987) per bottle – 165 percent higher than the auction house’s estimate. The King of Asian Duty Free, King Power. King Power, a Pan-Asian duty-free powerhouse with interests in the Chinese alcoholic drinks market, has acquired Bordeaux’s Château Bernadotte from Champagne Louis Roederer for an undisclosed sum. La Bernadotte has 100 acres of vineyards in Haut-Medoc, producing about 17,000 cases a year. It joined the Roederer stable when the Champagne house purchased second-growth Château Pichon Longueville Lalande in 2006.